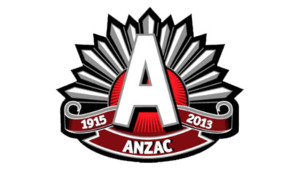 During the traditional ANZAC match against the Melbourne Storm the Warriors had a heat transferred ANZAC emblem on their away jersey. The Melbourne Storm also had the emblem for this game and typically always have one when playing the ANZAC match. Im unsure whether the team used new jerseys after or just ripped the transfer off. By Round 12 against the Tigers when the team next wore their away jersey the emblem was gone. NOTE: The year on the right read 2010, not 2013 as above. Best picture I could find.